Bernard is a poet and performer who leads writing workshops for children (and sometimes adults). 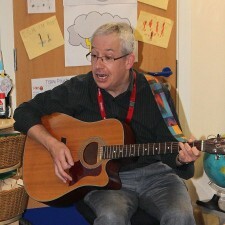 He's performed in schools, libraries, leisure centres, pubs, playgroups and supermarkets! and many literary festivals including Hull, Ilkley, Lancaster and the Young Readers Birmingham Festival. His poems feature in numerous anthologies for young readers (including The Works, Poetry Store, Wizard Poems, Pet Poems, Family Poems, Space Poems, How To Survive School, The Secret Life of Pants, The Jumble Book) and have been broadcast on local and national radio and on TV. School visits usually begin with a performance in the hall followed by workshops. (But I'm very flexible and fit in with what you want and, as you can see from my picture, I accompany some of the poems with guitar). I can bring my books (What Are You Like? (2018) £5.99, Brilliant £5.99, Wanted Alive, £4.95, and Shouting at the Ocean, £4.99) to sell & sign. I often work with councils and help deliver sustainable travel and road safety messages. Listen, Laugh, Tap Your Feet and join guitar playing poet Bernard Young for a fun filled performance of poetry for children (and their grown ups!). Join in...listen, laugh and tap your feet. Yeah! 'Thank you for the poems, fun and inspiration. Brilliant!' Settrington School, N. Yorks. Over 80 tried and tested poems regularly used in primary schools. Published Feb 2018. Poems about behaving brilliantly. And badly! Poems about chocolate, robots, aliens. (And Great-Grandmother's false teeth!). Wide variety of poems from Bernard Young and Trevor Millum who are Double Talk!